14/16 Reagen Sulewski Eyepopping visuals, but without Robin Williams, this would be a horror show. 80/85 Kim Hollis It looks like it should be good. But it's not. In fact, it's quite dull and bereft of story. 138/166 David Mumpower The animation company has since apologized for the weakness of the script. Commenting further would be rudely kicking them after they've already turtled. 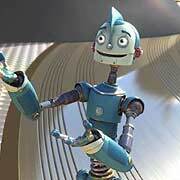 Robots is a CGI-animated film from the same studio and director who brought you Ice Age. Set in a world populated by the eponymous machines, the story follows a young genius robot who wants to improve his kind so they will be capable of making the world a better place. Of course, he is opposed by forces who wish to maintain the status quo for their own selfish reasons, and who place the expected obstacles in the young robot's path. There'll be romance and comic relief, and, one expects, good will ultimately triumph over evil and those who have a talent for it will live happily ever after. See the latest developments for this project on the Robots Movie News page.